Offering you a complete choice of products which include wooden wardrobe and walking wardrobe. 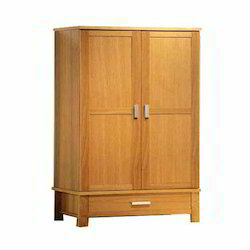 We offer optimum quality wooden wardrobe to our valuable customers. Precisely designed in compliance with the industry set standards, these wardrobes are commonly used to store various household items such as cloths in most efficient manners. We deliver these wardrobes within the promised time frame due to the sincere efforts of our logistic professionals. We are engaged in manufacturing, trading, wholesaling and exporting high quality Walking Wardrobe. Manufactured from optimum grade wooden melamine board, these wardrobes are widely used for storing household items are cloths. The quality controllers keep a strict vigil over the entire manufacturing processes to ensure that these processes are carried out in compliance with the international quality standards. Looking for Walking Wardrobe ?